Garage storage hooks should form part of any garage make-over as they provide a clean and really easy way to lift anything from your garage floor and have it accessible via your garage wall. Today garage storage hooks come in lots of sizes and can be hang off any surface. Storewall goes one step further with its slatwall panels by also allowing you to move them around as you please as well as lock them in for safety. Storewall offer over 20 varieties of garage storage hooks which can be used to hang anything from bags to gardening equipment and even tools and wheel barrows. All storewall hooks are made of industrial steel and powder coated so that they stay looking professional for a very long time. Let’s take a closer look at the Heavy Duty Utility Hook. 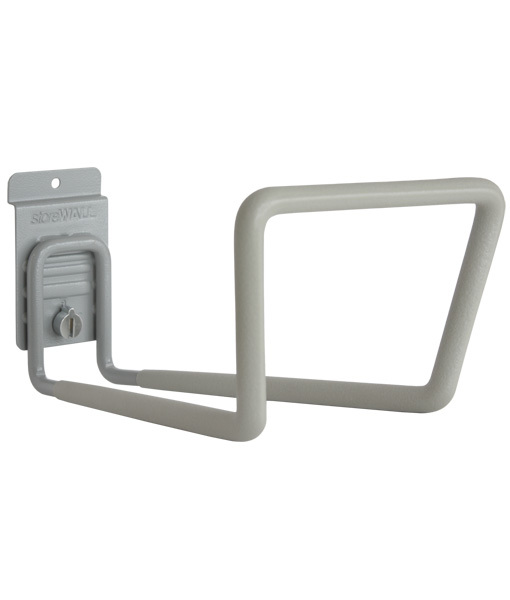 StoreWALL Heavy Duty Utility Hook is the ideal solution for hanging your ladder (more than one is possible), electrical power leads or hoses or even large pieces of timber. The Storewall Heavy Duty Utility Hook comes pre-installed with CamLok™ to ensure your items stay where you hang them and not on the floor because the hooks has come off the wall. Sizing of the Utility Hook is 228mm off the wall x 178mm at the widest point x 140mm in height. In terms of weight, the Heavy Duty Utility Hook can hold 68KG where the slatwall panel has been installed and is supported with InstallStrips. With such an extensive range of garage storage hooks how can you resist not cleaning up your messy garage and making room for you to easily and safely move around.